Leader of Opposition Winnie Kiiza addressing journalists at Parliament. Courtesy photo. The long-awaited Presidential age limt amendment bill has been tabled in Parliament. The contentious bill was tabled by Igara West MP Raphael Magezi and seconded by among others Hon Moses Balyeku of Jinja West Municipality. Magezi tabled the motion shortly after resumption of plenary which went into a forced break, after opposition legislators turned rowdy. The Opposition MPs were protesting the suspension of their colleagues by Speaker Rebecca Kadaga over indiscipline exhibited yesterday. The Speaker reportedly suspended 24 MPs, accused of causing mayhem in Parliament during yesterday’s heated session. According to the Speaker, the MPs were suspended because their conduct was in disregard of the codes of Conducts and defaulted Rules of Procedure during the plenary session that sat on September 26, 2017 where they denied Parliament to conduct its business. The Age Limit motion was tabled in the absence of most of the other opposition MPs who stormed out the chamber in protest. 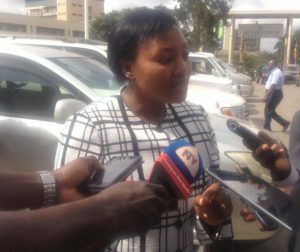 The MPs led by the Leader of Opposition Hon Winnie Kiiza walked out, after she expressed her dismay on the manner in which her colleagues were treated. Before she could finish, she was ordered by the speaker to sit down; which promoted her and her colleagues to walk out. Magezi’s motion which also seeks to remove the age limit on Local Council Chairperson contestants was seconded by MPs Moses Balyeku, Jackson Karugaba Kafuuzi, and Doreen Amule. The seconders of the motion argued that Article 102 of the Constitution is discriminating and needed to be amended. “Age should not be a yardstick for one to be eligible for democratic election in a democracy like Uganda,” said Hon Amule. Hon Balyeku also noted that it is improper to discriminate people on account of their age.